Protected area managers and protected area agencies are increasingly being asked to provide details of the wider social and environmental benefits of the lands and waters under their management. 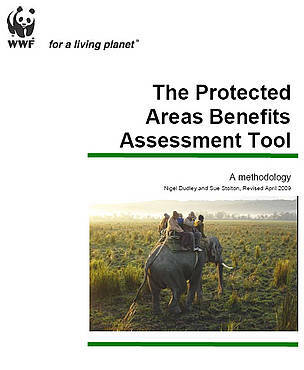 This tool provides a methodology for collating such information for individual protected areas. The Protected Areas Benefits Assessment Tool (PA-BAT) is designed to fill an important gap in the toolbox of protected area agencies and conservation institutions, by providing a methodology to collate and build information about the overall benefits from protected areas. As pressures on protected areas continue to develop over time, and demand for land and water, and for management resources, is increasingly stretched, park managers need to have arguments for protection in place and backed by a solid body of data collected over time. This need is recognized explicitly in the CBD Programme of Work on Protected Areas, for example in paragraph 3.1.2: "Conduct national-level assessments of the contributions of protected areas, considering as appropriate environmental services, to the countrys economy and culture, and to the achievement of the Millennium Development Goals at the national level; and integrate the use of economic valuation and natural resource accounting tools into national planning processes in order to identify the hidden and non-hidden economic benefits provided by protected areas and who appropriates these benefits. " The PA-BAT aims to help collate information on the full range of current and potential benefits of individual protected areas. It is a contributory methodology for the overall Arguments for Protection series, but is also hopefully a stand-alone tool that will be of wider use to the protected areas community. Although developed primarily for use in protected areas, the tool could have wider application, for example in assessing wider benefits of forest management units, agricultural landscapes or areas set aside for recreation. The main audience for this report is protected area managers and authorities, but it should also be useful for anyone interested in finding out about the range of benefits that protected areas provide.